Zupafood™ ELITE brings you a unique array of nutrient rich components. Rare medicinal mushrooms, New Zealand grown ingredients, marine sourced collagen and other premium ingredients work synergistically to support all aspects of your health and well-being. Flavored with stevia and natural apple, each packet of Zupafood ELITE provides a refreshing, delicious tonic that will leave you feeling and looking your best. Zupafood ELITE is a sustainably sourced, scientifically formulated blend of nature’s finest superfoods. Crafted through in-depth research and a quest to include only the highest quality and most effective organic extracts, each packet brings you an impressive 10,000 mg of health-giving nutrients in an easy-to-consume superfood powder form. When life gets busy, the first thing to suffer is often our diet. We reach for food that satisfies our cravings but often doesn’t meet our nutritional needs. Zupafood ELITE fills in the gaps for you, delivering the rich array of nutrients your body requires to achieve optimal condition. Zupafood ELITE is energizing too. It contains just enough naturally occurring caffeine from Green Tea to kickstart your morning or recharge your afternoon. Instead reaching for a coffee or energy drink, tear open a packet of Zupafood™ ELITE for a revitalizing boost. How does Zupafood™ ELITE work? Zupafood ELITE contains 75 mg of high quality green tea extract. That’s just enough caffeine for a mild buzz without the “jittery” effect of coffee. Green tea extract also contains L-theanine, an amino acid that helps improve mood. Studies show that caffeine and L-theanine work together to stimulate brain activity, helping you stay mentally and physically focused. As we age our natural levels of collagen and elastin start to fall. Zupafood ELITE helps you fight this decline with 2,000 mg of fully digestible collagen and elastin in every serve. Derived from sustainable marine sources, these components help to firm and lift sagging skin, minimize the appearance of wrinkles and support healthier skin and nails. Many of us suffer from low levels of calcium. Zupafood ELITE helps raise calcium levels with a unique form of plant calcium. Produced by red algae it is highly bio-available and won’t build up in your cardiovascular system. We have included 500 mg in every serve, which equates to the calcium benefits of eating an entire cup of raw spinach! Zupafood ELITE is the only superfood powder on the market to bring you the benefits of certified organic medicinal mushrooms. 400 mg of each serve is made up of a special blend of Cordyceps, King Trumpet, Agaricus and Lion’s Mane Mushrooms. Medicinal mushrooms have a host of unique health-giving properties. In particular, they contain an antioxidant called L-ergothioneine which penetrates deep into the cellular nucleus to support the very building blocks of good health. Each packet of Zupafood ELITE includes 3,800 mg of our base superfood blend. Comprised of Kiwifruit, Grape Seed, Grape Skin, Wheat Grass, Barley Grass, Chlorella and Spirulina, this nutritious foundation works wonders to help improve digestive health, heart health, joint health, cholesterol level management, circulation, immunity, liver health and blood sugar levels. Zupafood ELITE superfood powder is sweetened with stevia and flavored with 100% real apple – free from all artificial additives or flavorings. Simply mix with water or your favorite beverage and enjoy a refreshing tonic that is as delicious as it is natural. Other ingredients: Flavors (Natural Green Apple, Malic Acid, Citric Acid), Natural Sweetener (Stevia Glycosides). Add water, juice or your favourite beverage and shake vigorously. Note – cold or warm water is fine, but do not use hot water as it can cause the ingredients to come out of suspension. Warning: Not recommended during pregnancy or breastfeeding due to inclusion of medicinal mushrooms. 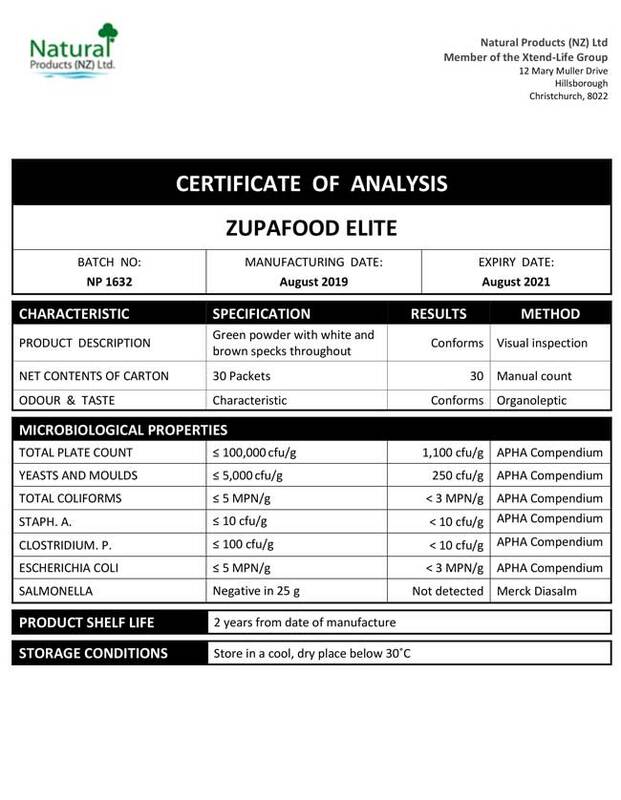 Please view our Zupafood ELITE Certificate of Analysis (CoA) below. What are the differences between each of the three Zupafoods? All Zupafoods contain the special Xtend-Life 'Superfood' blend made up of organic fruit extracts, green tea extract and marine calcium. Zupafood GREENZ contains additional organic greens to support digestive health and gently detoxify the body. Zupafood for SKIN contains marine sourced collagen to nourish skin from within. Zupafood ELITE contains the largest array of ingredients with the superfood base blend, organic greens and marine sourced collagen as well as high potency medicinal mushrooms to support energy levels, cardiovascular health, immunity, the libido and to help fight the signs of aging. Where are your Organic Medicinal Mushrooms sourced from? We went to the world's experts in cultivating medicinal mushrooms, M2 Mushrooms in San Marcos, California USA. They cultivate and process certified organic mushrooms. Their experts developed a unique blend of mushrooms just for Xtend-Life that would help achieve the objectives of Zupafood ELITE. Can Zupafood be taken together with other Xtend-Life products? Can I use more than one Zupafood version at the same time? Should I stop taking Total Balance or Multi-Xtra if I am going to start using Zupafood? Although Zupafood is packed with nourishing ingredients, it does not contain the complete array of vitamins and minerals you needed from your diet. For this reason we encourage you to keep using Total Balance or Multi-Xtra at the same time as Zupafood. Can you overdose on the ingredients in Zupafood? Zupafood ELITE contains wheat and barley grass – are you sure it’s gluten free? Yes, Zupafood ELITE is gluten free. We have tested both the wheat and barley grass extracts for the presence of gluten. Results showed that gluten was not detected at 3ppm (parts per million). This level meets the accepted standard for gluten free which is below 20ppm. If my Zupafood has gone hard in the packet is it still okay to consume? How much Iron is in Zupafood ELITE? There is a maximum of 2000 ppm of Iron in Aquamin TG which is part of the base blend in all the Zupafood versions, this is equivalent to a maximum of 0.2%. There is also an additional 1 mg of iron per serving of Zupafood ELITE which is naturally occurring in the other ingredients. Is Zupafood a good option for people that have difficulty in swallowing tablets, such as the elderly?